Two weeks later that was the focus of his rallies. In Pennsylvania, he warned that the only way he could lose the state was through cheating. Earlier that week, he asked supporters in Colorado to turn out in droves to help monitor polling places. Political experts who have studied election fraud for years have denounced the claims, reporters covering the candidate have dismissed the statements over and over, and more than one political satirist has poked fun at the warning. Yet Trump’s warning resonates with those voters who already are fearful of crooked media and a federal government they believe is saturated with cronyism and closed-door dealing. Trump was asked in the final presidential debate if he would accept the outcome of the election but he refused to commit. He later said he would accept it if he won. One of the best ways to track the evolution of Trump’s emphasis on election fraud is to study his communication tool of choice: Twitter. 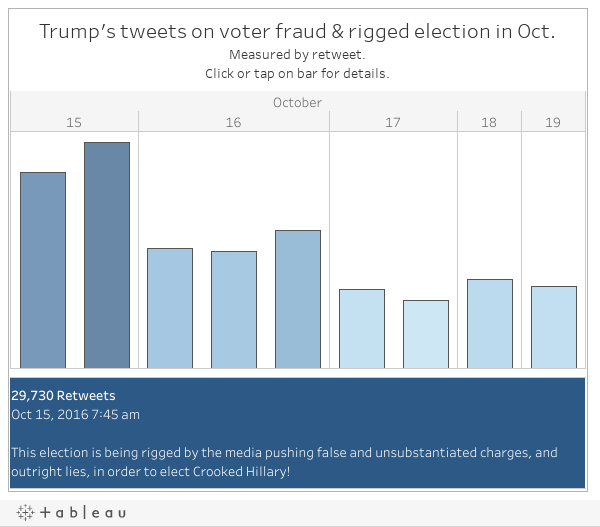 Between January 2016 and today, Trump has tweeted 14 times about “rigged elections” or “voter fraud.” A big contrast to Hillary Clinton, whose only mention of rigging was through a retweet of President Barack Obama. 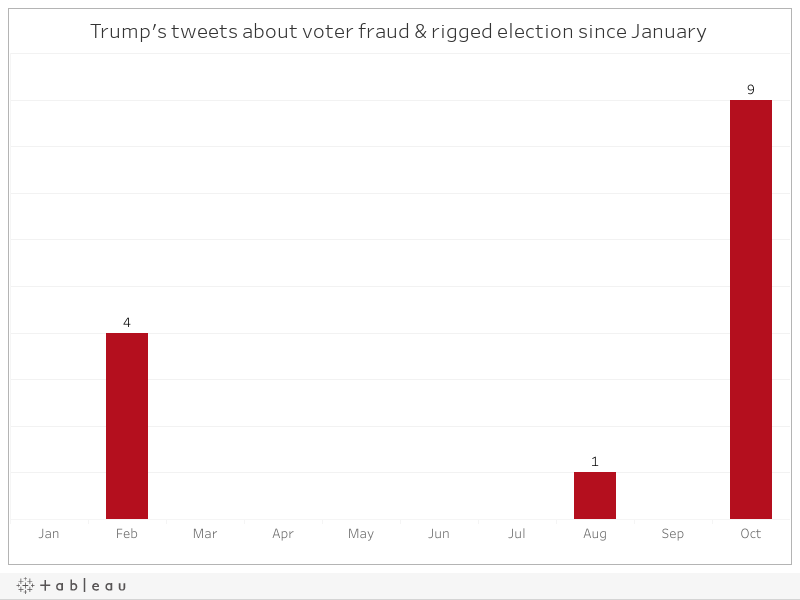 But if you dig deeper into Trump’s tweets about fraud and rigging this year, you’ll see that they’ve come in small spikes and that his use of the terms goes back further than his warnings that he may lose the presidential race. 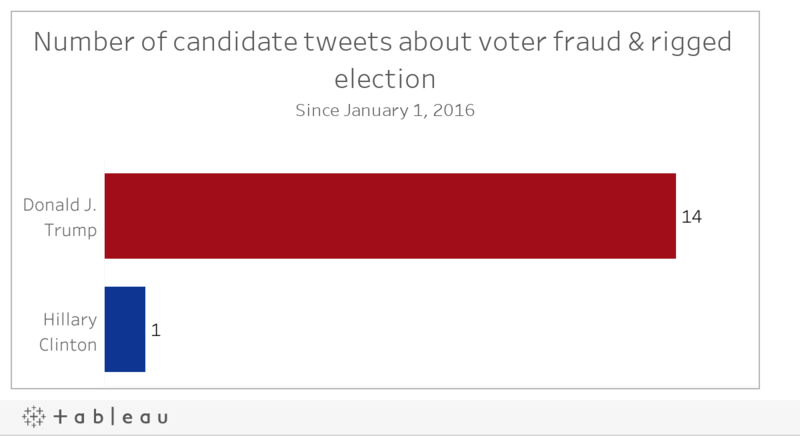 In fact, Trump started tweeting about election fraud in February at the very beginning of the primaries. But it wasn’t the Democrats or the election system he was blaming, it was his challenger, Sen. Ted Cruz, R-Texas. After losing the Iowa Caucuses to Cruz, Trump used Twitter to claim that the Texan “illegally stole” the election. He later deleted that tweet and replaced it with one that removed the word “illegally.” The other three tweets followed the same line of reasoning. Trump backed off claims of rigging until August when he tweeted once insinuating that the Democratic National Committee “rigged the election against Bernie.” It was a claim many in the Bernie Sanders camp also were making at the time as the primaries hit California and the Vermont senator lacked a clear path to the nomination. But it wasn’t until October that Trump’s claims hit national proportions. Nine times in five days the now Republican nominee tweeted warnings about the election being rigged against him. The first, which generated almost 30,000 retweets, claimed it was the media doing the rigging. Another insinuated the election was rigged because Clinton herself wasn’t in jail. Later, his tweets combined the two. Interestingly, on Oct. 17, he insinuated that the Republican leadership was in on it, asking, “Why do Republican leaders deny what is going on? So Naïve!" While he hasn’t tweeted about fraud or rigging since--perhaps because his Twitter account is now being monitored by his campaign staff — the candidate still talks openly about the possibility of election fraud at his campaign rallies.